Welcome to the first post of a new weekly feature‐Tag Tuesday. I enjoy making tags, especially if I’m trying something new. They’re a great way to explore a new technique without worrying about ruining a huge batch of supplies, or about covering a lot of surface area. Tags are also an easy way to use up leftover pieces and parts of other projects while they are already coordinated and out on the table. And sometimes, well, they’re just fun to make. 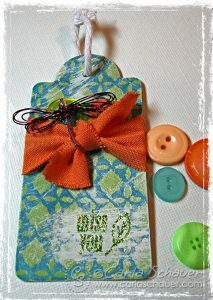 This tag began as a plain white piece of cardstock, die‐cut with my Sizzix Big Shot. I used a Glacier Lake Cat’s Eye inkpad to directly apply ink to the tag. I knew I wanted to add some lime to the background, but since I applied such a heavy coat of the aqua, the lime ink wasn’t going to cover it well. Instead, I chose Lime acrylic paint from DecoArt and a Crafter’s Workshop stencil, and used a medium‐sized texture brush to dab the paint over the inked tag. I still wasn’t quite happy with the background, so I used Light Buttermilk acrylic paint dry‐brushed over the top to soften the boldness a bit. 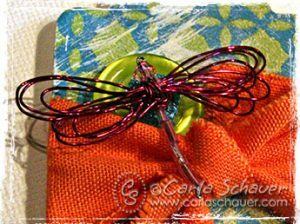 I knew I wanted to use a tiny bead and wire dragonfly rescued from our Crafty Couture Dress, but I wanted more contrast between the dragonfly and the background. A scrap of bright orange fabric was the perfect complement to the lime, aqua, and berry. 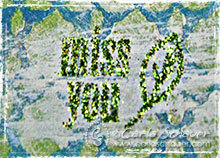 I perched the dragonfly on a lime button, and added a lime glittered sentiment using a piece from the Lots of Thoughts pack of Design Adhesives from Clearsnap (designed by yours truly). Thanks for checking out my first Tag Tuesday!